While companies have been adding promotional messages to statements for decades, today’s leaders are taking steps to make these messages personal, timely and relevant. By leveraging communication intelligence in the mailstream, these innovators have successfully transformed transaction documents into powerful strategic assets. One of the most significant developments has come in the application of location intelligence — where businesses are using precise location data to not only target more effectively — but also to learn more about the needs, desires and spending habits of their customers. 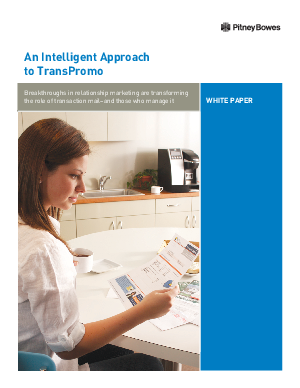 This White Paper examines the changes that are taking place, the factors that drive success, and the growing importance of statement management in this new TransPromo world.